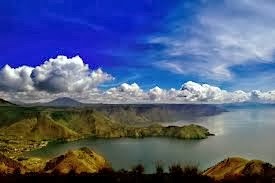 Soal Narrative Text, Soal, Jawaban "The Story of Toba Lake"- Once upon a time, there was a man who was living in north Sumatra. He lived in a simple hut in a farming field. He did some gardening and fishing for his daily life. One day, while the man was do fishing, he caught a big golden fish in his trap. It was the biggest catch which he ever had in his life. Surprisingly, this fish turned into a beautiful princess. He felt in love with her and proposed her to be his wife. She said; "Yes, but you have to promise not to tell anyone about the secret that I was once a fish, otherwise there will be a huge disaster". The man made the deal and they got married, lived happily and had a daughter. Few years later, his daughter would help bringing lunch to her father out in the fields. One day, his daughter was so hungry and she ate his father’s lunch. Unfortunately, he found out and got furious, and shouted; “You damned daughter of a fish”. The daughter ran home and asked her mother. The mother started crying, felt sad that her husband had broken his promise. Then she told her daughter to run up the hills because a huge disaster was about to come. When her daughter left, she prayed. Soon there was a big earthquake followed by non-stop pouring rain. The whole area got flooded and became Toba Lake. She turned into a fish again and the man became the island of Samosir. Sebelum itu, jika soal ini anda berikan kepada siswa/siswi anda, jangan melampirkan judulnya, biarkan mereka yang menentukan sendiri judulnya. Based on the Text above, please choose the best answer by giving the cross mark in the letter T if the statement is true and the letter F is the statement is false. 1. T – F The golden fish turned into a beautiful woman. 2. T – F The man and his wife lived happily forever. 3. T – F The man had broken his promise. 4. T – F His daughter turned into a fish. 5. What is the complication in paragraph 3? A. The mother started crying, felt sad that her husband had broken his promise. B. His daughter would help bringing lunch to her father out in the fields. C. His daughter was so hungry and she ate his father’s lunch. D. The daughter ran home and asked her mother. E. The man shouted and be furious. 6. Finally, what did happen to the man? 7. What can we learn from the text above? 8. What is the best title of the text above? The man made the deal and they got married, lived happily and had a daughter. The mother felt sad and started crying because her husband had broken his promise. Soon there was a big earthquake followed by non-stop pouring rain. The whole area got flooded and became Toba Lake.